Went to a punchie class with my SU upline this week, we made two cards using mostly punches. 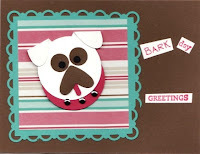 You can see on the pug card, I still need a bit of work getting the hang of the border and corner punches on the same card hahahaha, I am so NOT coordinated. 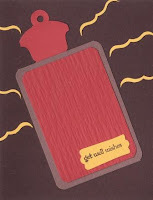 The hot water bottle card, we thought if you took the ring off the plug at the top, it would make a great whiskey flask!